The United States Congress designated the Mountain Lake Wilderness (map) in 1984 and it now has a total of 16,525 acres. 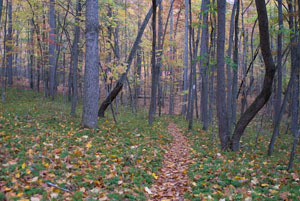 Virginia contains approximately 13,804 acres. West Virginia contains approximately 2,721 acres. It is managed by the Forest Service. Mountain Lake, the only natural body of water in western Virginia, sits just outside the southwestern boundary of Mountain Lake Wilderness. Inside the boundary lies a highland plateau resting squarely on the Eastern Continental Divide, including isolated stands of virgin spruce and hemlock in a typical Appalachian hardwood forest, a mountain bog, and War Spur Overlook, which yields a panoramic view of this wilderness. Elevations range from about 2,200 feet to over 4,000 feet on Lone Pine Peak near the middle of the area. The diversity of flora and fauna is significant. There are 21 miles of trail within the wilderness including about five miles of the Appalachian National Scenic Trail (A.T., FT #1). Trail information is available on National Geographic-Trails Illustrated Map # 787 (Blacksburg-New River Valley). Mountain Lake Wilderness is located in Craig and Giles Counties in southwest Virginia, and Monroe County, West Virginia. It is managed by the U.S. Forest Service as part of the Eastern Divide Ranger District of the George Washington & Jefferson National Forests. Planning to Visit the Mountain Lake Wilderness? How to follow the seven standard Leave No Trace principles differs in different parts of the country (desert vs. Rocky Mountains). Click on any of the principles listed below to learn more about how they apply in the Mountain Lake Wilderness.